A few days ago Pim Reinders mailed me that he almost has all the money needed to finance the project that he, Dolf Hell (more about him in a next episode!) and me launched a year ago. 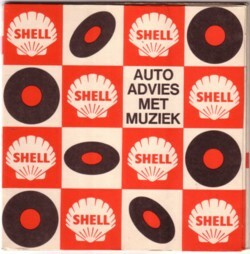 It is a book with two CD’s, that should give an oversight of the Dutch advertisement records made in the period 1955-1975. I have been trying to get this thing published without success for 15 years, but then I got in contact with Pim Reinders and he got things rolling. Pim is the man hehind Reclame Arsenaal, a wbesite dedicated to Dutch advertising. He also did many other projects and wrote some books. His energy is impressive. I get already tired when I only think of having a meeting with the kind of people you have to deal with to get such a project realised, but Pim actually goes to these meetings and has endless talks with all kind of people that I carefully avoid. Within a year he managed to get whatever was needed for this project: money, a publisher, copyrights, etcetera. 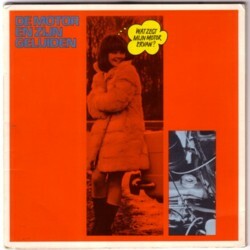 He also thought up the name: Shoebidoewaa, which is the title of a yellow flexi record that was made by Nutricia. The main problem for this book were the copyrights. To release two CD’s, we have to pay a few thousand euro’s to the Buma/Stemra. None of that money will go to the artists, because of the weird way this organisation works. It is a ridiculous situation, but if you want to publish a book with two CD’s, it has to be dealt with. 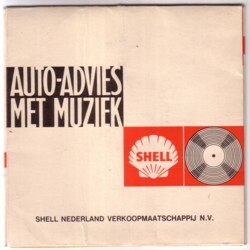 I was already preparing to dump my whole collection of Dutch advertisement records (which forms the basis of this project) on the Internet. But thanks to Pim it seems that Shoebidoewaa will be in stores by the end of 2009. For a while I was so sick and tired of all the efforts trying to raise some interest for this material, that I have not written much about Shoebidoewaain this Soundtrack, but I will do that in the near future. 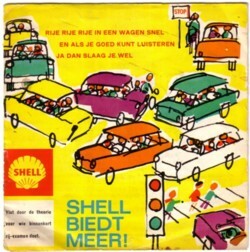 Here is one of the more than ten advertisement records that Shell has made in the sixties. You need to speak Dutch to fully enjoy this part, but here is also a typical advertising tune, made by Benny Vreden.